The expertise of the surgeon and operating team. The number of follicles (hair roots or grafts) to be transplanted. Quality and site of Donor area. Rejuvenate perfect hair transplant centre is known for mega and Giga sessions. The main advantage of this centre is two well-qualified surgeons (ABHRS) extracting graft simultaneously so as to reduce the extraction time further. The team is well trained in FUT follicle dissection also. So it is one of the few centres in India where both FUE and FUT is done with equally good results. Most important factor deciding the duration of best hair transplant clinic is the experience of the hair transplant surgeon, His knowledge about the procedure & how frequently he is doing the procedure. 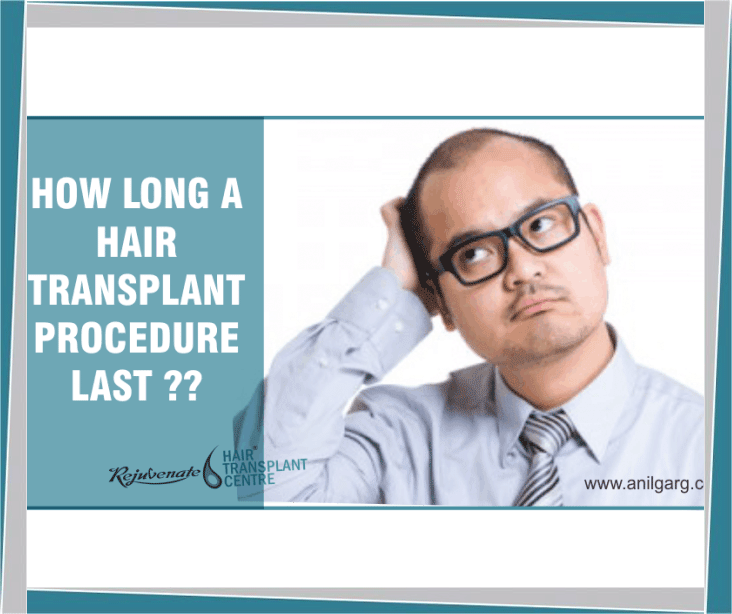 Extraction of 1000 grafts can be done by a surgeon in 40 minutes to 1 hour if he is doing extraction routinely, but a same number of grafts may take 2-3 hours if it is done by a novice surgeon or if he is doing hair transplant rarely. A well-qualified surgeon extracts graft faster and also with negligible transaction rate so as to give a good result of hair transplant. A number of hair roots require more time. Mega sessions and Giga sessions are done in two days with 6-7 hours in a day for surgery. In hands of experts, 3000 grafts can be done in one day, If a grade of baldness is IV. But if a grade of baldness is more or person requires more coverage and density then it can be done in two sessions. Good quality donor means hair roots with good density and thickness. If grafts are healthy less time will yield more result but if miniaturization of grafts is more then it will take more time. A site of donor also alters the time taken in the surgery. Usually, scalp hair is best but beard hair is also good and less time consuming for extraction, but if chest hair is to be used as a donor it will take more time. Again experience of the surgeon is an important factor here. The previous scarring in the donor area may lead to fibrosis. It may cause excess oozing, make the skin tough and reduces density. These all factors may be responsible for increasing the time of the surgery. In a previous FUT scar case, it is easier to do FUE from the surrounding virgin area than in a previous FUE case. The technique of the hair transplant Whether FUT Hair Transplant or FUE Hair Transplant does not affect much the duration of the surgery if the operating team is trained in both techniques. Previously it was said that FUE is more time consuming than FUT. But nowadays FUT is more demanding as it requires a number of trained staff, Also surgeon and patients are preferring FUE. We can say that it is not the technique which decides the time of the surgery but it is the surgeon’s expertise and staffs capability which is the main factor for deciding the duration of the hair transplant.